Recently a client of mine had an issue with Facebook and the way the Facebook Lint system picks up information concerning their website when it’s shared. Obviously sharing and seeing old site descriptions or images is not ideal, but there is a solution. Simply visit the following URL and enter your site’s web address. The information will be re-parsed and should return the current data. Simple! 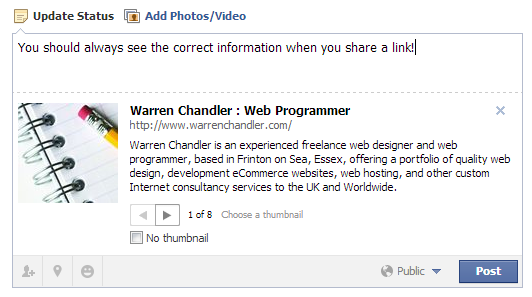 So if you’re trying to share a website and are seeing the old site or old data, a few clicks will fix this issue.